If you’re constantly multitasking and glued to your phone, Flygrip allows you to free up one hand and multi-task efficiently without the fear of dropping your phone. Flygrip also doubles as a kickstand in both portrait and landscape viewing angles. Our experience has shown that only the iPhone 4S / iPhone 7 and iPhone 7 plus and the Nexus 4 are both constructed with Gorilla Glass on the back. Gorilla Glass will not allow anything to adhere to it, so for these phones you must use a case. Flygrip’s pocket ability is always a common question. Flygrip is only 0.635 cm thick, and we have found that this slight added thickness will not be an issue – in fact, you will most likely not even notice it! Flygrip also works with most holsters. The leather type that is flexible usually has no problem housing the Flygrip, and if you have one of the more portrait plastic holsters, the phone’s screen can face the body, and the Flygrip/back facing outward, so no problem there either. Users who carry their phones in their purse, Flygrip’s slight added thickness will not affect you. When closed, Flygrip takes up only about 0.635 cm of space. So as long as there is enough room in your holster for an extra 0.635 cm, Flygrip will fit without a problem. For other holster styles that snap to the front of the phone, Flygrip works perfectly with those as well. ‘Medium’ is for fingers 1.58 cm thick. You can use the R1 test as shown on the size graph in the shopping page. ‘Large’ is for fingers that are up to 1.90 cm thick. You can use the R1 test of the size graph in the shopping page. There are three main reasons why Michael developed Flygrip to be an accessory that attaches to the phone, as opposed to a single phone case. We know many smartphone users are biased to their phones and their phone cases. There are many case styles, colors, textures, materials, etc from which to choose. We did not want to limit the choice to the user by forcing them not to use their preferable case choice, as the Flygrip will stick to most cases on the market. Also, many users do not want a case at all, and Flygrip will accommodate those users as well. We felt it was the only way to provide the user with a CHOICE and not limit their selection. You will also find that as you use Flygrip, you will realize that you’re not going to drop your phone, and may reconsider getting cases that are extremely thick and bulky. Another reason for Flygrip to be created as an attachment to your phone or phone case was to provide the best comfort and usability. Not all hands are the same, and not all phone sizes are the same. 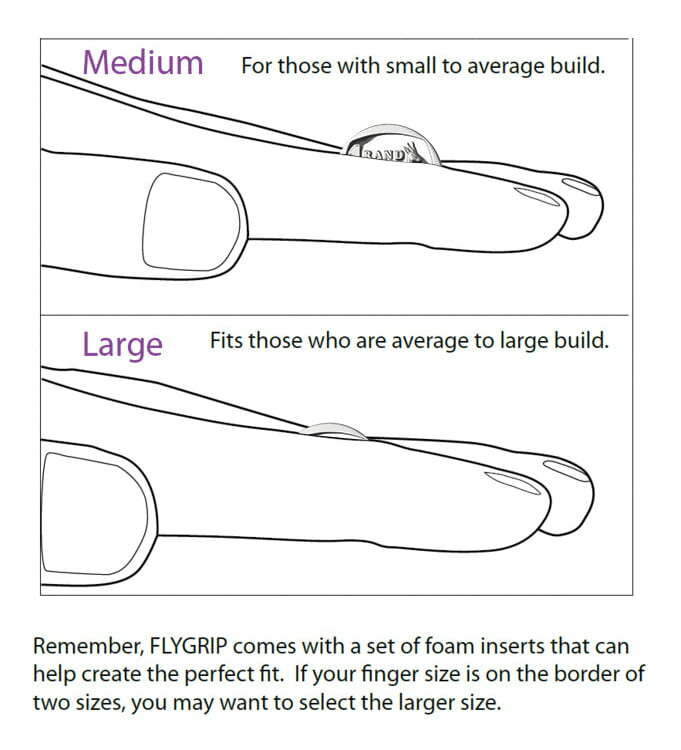 Flygrip gives you the choice to install it anywhere on the phone in order to provide the best position for your fingers. By providing this level of customization, Flygrip offers you with the most comfort and usability. Lastly, we know most smartphone users switch their phones every two years (some more, some less). We felt that our users should be able to enjoy their Flygrip from phone to phone without having to be forced to buy a new Flygrip each time. From our experience, NFC works from about 2.54 cm to 3.81 cm distance and is usually placed on the top back of the phone. Flygrip is positioned on the bottom of the phone, and is only 0.635 cm thick, so from our own testing, it has not interfered with NFC communications at all. We’ve had some luck with wireless chargers. Not all chargers seem to provide the same range/distance in their charging capabilities. Recent news shows that upcoming wireless chargers will have a range of 40mm, which is about 3.81 cm distance, which is much more than enough for Flygrip’s slim 0.635 cm thickness. Safety – While using Flygrip, you are able to keep your phone at a comfortable distance, compared to the traditional method of holding the device. When using two hands, you tend to have the phone closer to your face. Having the phone further from your face gives you the ability to see what’s going on around you. Having awareness of your surroundings is not just important for walking on the sidewalk, crossing the streets, etc, but also gives you awareness of potentially dangerous situations that are happening around you. More socially appropriate – It sounds funny, but when your face is planted in your phone, you are less social. When in public, putting your full attention into a device is antisocial. We are social beings, and I see too many people engrossed in their phones in public. Flygrip can provide a more casual way of using your phone. Two hands on your phone automatically positions the phone dead center of your body, whereas with one hand, it does not. Another example: Let’s say you are walking with your girlfriend (or boyfriend), your spouse, or even your child, and you are holding their hand. You feel the vibration that you got a text message. Now, in the situation where it’s your girlfriend or wife, are you rude and let go of their hand to answer it? Well, very few of us may have the dexterity to get the phone out of our pocket, into our hand, slide to unlock, and text back the message all with one hand AND while walking. With a Flygrip, all of us can do this, and never miss a step. Less neck Strain – Most people have their heads down when using their phone, because they want gravity to help keep their phones in their hands. This constant downward angle puts strain on your neck. Many users have written to us about this and how Flygrip has helped. You are able to keep your phone more vertical, thus keeping your head up, which means less strain. Using your phone while laying in bed – “I have dropped my phone on my head a million times while playing ‘Words with Friends’ in bed.” We heard this at least 50 times at the trade shows we have been to. It’s true, you are able to fight gravity and have the phone completely upside down without fear of it landing on your head. This gives you many new angles to enjoy your device. Pinch and zoom – With Flygrip, you can pinch and zoom with one hand while holding the phone. Try doing that without a Flygrip. Swyping – There are many different typing styles out there. One popular method is “swyping.” Flygrip provides such a great reach with your thumb that entering text using the Swype style keyboards is a pleasure. Camera – This has been a very popular benefit for our users. Shooting video or taking photos typically becomes a two-handed operation for most. You carefully grab the edges of the phone, being careful not to touch the front of the screen, otherwise you may end up misclicking something, and then you use your other hand to tap the camera button on the screen. This sometimes leads to an unstable shot because your tap sometimes moves the camera. When using two different hands in mid-air, stability is not as good as if you rest your forearms on a table to stabilize yourself. If you try to take a photo using one hand without a Flygrip, you may drop your phone because you typically use your thumb and middle finger to hold the slim edges of the phone, and you try to use your pointer finger to hit the camera button. We have all done this, and it’s not the most convenient way to shoot a picture. Shooting both a portrait or landscape video or photo with a Flygrip is extremely stable and much easier. It’s also great for different angles for video. I have been in situations (such as at a concert) where I am trying to shoot a video in a crowd, and holding the phone over the person’s head in front of me. The extended reach without fear of dropping your phone is simply great. I can even tilt the phone over the head and tilt the camera down. Try doing that without a Flygrip and you can twist your wrist. Keep in mind that others around you are bumping into you. The chances of dropping your phone are very high. Selfies – Selfie photos and videos are much easier with a Flygrip. Using the front facing camera and extending your arm as far as possible to get a bigger view makes self photos easier and clearer. We have some top Instagramers and Viners who use Flygrip. Also, using the kickstand, front facing camera, and timer (or Samsung voice commands) makes for a great way to take a group photo when no one is around to snap one for you (or you don’t want to bother anyone). Tablets and Ebooks – Flygrip works great on Kindles/Nooks and small tablets. The black and white kindles are light, and avid readers rave about how great it works and provide so much less hand fatigue. On tablets, it works almost equally as well as a way to hold and reach “most” of the screen with one hand. In the field – IT Professionals from three different companies have reached out to us about their techs using Flygrip. Many times being in a server room, on your knees, propping yourself up with one hand on the floor and one hand on your Flygrip-enabled phone, trying to get behind a server, you can use the flashlight on the phone as well as ping a server using your phone. Salespeople at tradeshows and events who use a tablet for demonstrating their products (showing videos, etc), they put a Flygrip on the back of the tablet and it gives them an easy way to hold, show the display, and demonstrate their products online. Shopping – A few users have commented that when they go to the supermarket, the fact that they are able to use their phone for their grocery list or to text family members makes shopping much easier. They hold the phone in a reverse Flygrip position (between their fingers with screen facing out), with the same hand pushing the shopping cart, and this leaves a single hand free to grab product and put in their cart. PLEASE NOTE THAT WE ONLY SHIP IN SUB-SAHARAN AFRICA. What are the shipping costs for South Africa and Sub-Saharan Africa? We have done extensive research in the courier services in South Africa and has been able to standardise the delivery option for all residents in and around the Major Centres of South Africa as well as including those residents that live in an approximate radius of +/- 100km of the Major Centres. Major centre’s include: Bloemfontein, Cape Town, Durban, East London, George, Harrismith, Johannesburg, Klerksdorp, Nelspruit, Polokwane, Port Elizabeth, Pretoria, Rustenburg, Vereeniging, Witbank. (For detail instructions of our courier services, please visit our Shipping Policy. correct delivery charge for your address based on the correct delivery address you have completed on the site. Your order takes 1 – 3 business days to be processed and 3 – 5 business days to be delivered to your address, if you reside in and around the Major Centres. Deliveries to areas outside the Major Centres, the so-called Remote Areas, can take up to 7 (seven) business days to be delivered. We cannot ship to a postal address as you need to sign for the product to ensure that the product is indeed delivered in good condition. Once the couriers left your premises, we are of the opinion that the product was delivered in good condition. Any order of more than 10 Flygrip units at a time will be a bulk order and you need to contact sales@flygrip.co.za for your bulk order quote and best shipping rate. If you already have a Flygrip unit and just want to buy additional stickers or adhesives, the delivery charge will be the same as mentioned above for both areas, even if you just want to order one additional sticker or a pack of adhesives. We unfortunately cannot make use of the postal service as we have found it to be unreliable and therefore cannot guarantee that you will receive your order. We will therefor rather make use of our couriers and know that you will receive what you have ordered, every time. Any order of more than 10 stickers or adhesives at a time will be a bulk order and you need to contact sales@flygrip.co.za for your bulk order quote and shipping best rate. We offer a standard shipping fee of R350 to any Sub-Saharan African country. Your delivery will reach you between 7 – 15 business days. Any orders of more than 10 Flygrip units and more than 10 stickers and or adhesives at a time will be a bulk order and you need to contact sales@flygrip.co.za for your bulk order quote and best shipping rate. Please consult our detailed Shipping Policy for our shipping method to all Sub-Saharan Africa countries.